Solar panel electricity systems, also known as solar photovoltaics (PV), capture the sun’s energy (photons) and convert it into electricity. PV cells are made from layers of semiconducting material, and produce an electric field across the layers when exposed to sunlight. When light reaches the cell, some of it is absorbed into the semiconducting material and causes electrons to break loose and flow. This flow of electrons is an electric current, that can be drawn out and used for powering outside devices. This current, along with the cell’s voltage (a result of built-in electric fields), define the power that the solar cell is capable of producing. It is worth mentioning that a PV cell can produce electricity without direct sunlight, but more sunshine equals more electricity. A module, or panel, is a group of cells connected electrically and packaged together. several panels can also form an array, which can provide more electricity and be used for powering larger instruments and devices. Solar cells are roughly divided into three categories: Monocrystalline, Polycrystalline and Thin Film. Most of the world’s PVs are based on a variation of silicon. The purity of the silicon, or the more perfectly aligned silicon molecules are, affects how good it will be at converting solar energy. Monocrystalline solar cells (Mono-Si, or single-crystal-Si) go through a process of cutting cylindrical ingots to make silicon wafers, which gives the panels their characteristic look. They have external even coloring that suggests high-purity silicon, thus having the highest efficiency rates (typically 15-20%). They are also space efficient (their efficiency allows them to be small) and live longer than other kinds of solar panels. Alas, they are more expensive than other kinds and tend to be damaged by external dirt or snow. Polycrystalline silicon (p-Si or mc-Si) solar cells do not go through the abovementioned process, and so are simpler and cost less than Monocrystalline ones. Their typical efficiency is 13-16%, due to lower silicon purity. They are also bigger and take up more space. Thin-Film solar cells (TFSC), are made by depositing one or several thin layers of photovoltaic material onto a substrate. Different types of TFSCs are categorized by which photovoltaic material is deposited onto the substrate: Amorphous silicon (a-Si), cadmium telluride (CdTe), copper indium gallium selenide (CIS/CIGS), polymer solar panels and organic photovoltaic cells (OPC). Thin-film modules have reached efficiencies of 7-13%. Their mass production is simple, they can be made flexible and are potentially cheaper to manufacture than crystalline-based solar cells. They do, however, take up a lot of space (hampering their use in residential applications) and tend to degrade faster than crystalline solar panels. Solar power is free and infinite, and solar energy use indeed has major advantages. It is an eco-friendly, sustainable way of energy production. Solar energy systems today are also much cheaper than they were 20 years ago, and save money in electricity expenses. In addition, it is a much environmentally cleaner form of energy production that helps reduce global warming and coal pollution. It does not waste water like coal and nuclear power plants and is also considered to be a form of energy that is much safer for use. Although solar power production is widely considered to be a positive thing, some downsides require mentioning. The initial cost of purchasing and installing solar panels can be substantial, despite widespread government subsidy programs and tax initiatives. Sun exposure is critical and so location plays a significant role in the generation of electricity. Areas that are cloudy or foggy for long periods of time will produce much less electricity. Other commonly argues disadvantages regard insufficiency of produced electricity and reliability issues. Common solar energy applications include various residential uses such as solar lighting, heating and ventilation systems. Many small appliances utilize solar energy for operation, like calculators, scales, toys and more. Agriculture and horticulture also employ solar energy for the operation of different aids like water pumps and crop drying machines. The field of transportation has been interested in solar powered vehicles for many years, including cars, planes and boats that are vigorously researched and developed. Solar energy also has various industrial applications, ranging from powering remote locations as well as space and satellite systems, to powering transportation signals, lighthouses, offshore navigation systems and many more. Solar technologies are vigorously researched, aiming to lower costs and improve existing products as well as integrate PV systems in innovative products like PV-powered curtains, clothes and laptop cases. Graphene is made of a single layer of carbon atoms that are bonded together in a repeating pattern of hexagons. It is a 2 dimensional material with amazing characteristics, which grant it the title “wonder material”. It is extremely strong and almost entirely transparent and also astonishingly conductive and flexible. 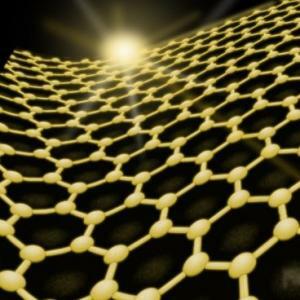 Graphene is made of carbon, which is abundant, and can be a relatively inexpensive material. Graphene has a seemingly endless potential for improving existing products as well as inspiring new ones. Solar cells require materials that are conductive and allow light to get through, thus benefiting from graphene's superb conductivity and transparency. Graphene is indeed a great conductor, but it is not very good at collecting the electrical current produced inside the solar cell. Hence, researchers are looking for appropriate ways to modify graphene for this purpose. 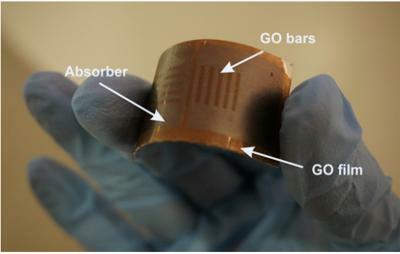 Graphene Oxide (GO), for example, is less conductive but more transparent and a better charge collector which can be useful for solar panels. The conductive Indium Tin Oxide (ITO) is used with a non-conductive glass layer as the transparent electrodes in most organic solar panels to achieve these goals, but ITO is rare, brittle and makes solar panels expensive. 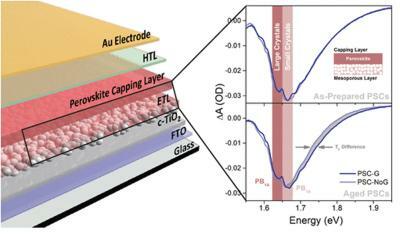 Many researches focus on graphene as a replacement for ITO in transparent electrodes of OPVs. Others search for ways of utilizing graphene in improving overall performance of photovoltaic devices, mainly OPVs, as well as in electrodes, active layers, interfacial layers and electron acceptors. While graphene-based solar cells are not currently commercially available, some efforts are bearing fruit in regards to the use of graphene in auxiliary aspects of PV. One such example is ZNShine Solar's G12 evolution era series - comprised of a 12-busbar graphene module, 5-busbar graphene module and double-glass graphene module. According to reports, the application of ZS's graphene film layer increases light transmission performance of the glass itself. 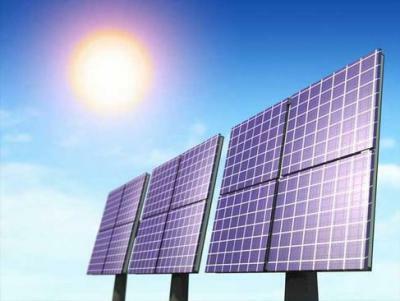 In addition, Znshine Solar's modules are self-cleaning. In July 2018, ZNShine Solar won the bid to provide 37.5MW of PV modules to Bharat Heavy Electricals Limited (BHEL), India's largest power generation equipment manufacturer. According to the contract, 10% of the shipment will be graphene-coated solar panels. Researchers at the University of Glasgow in Scotland have developed an electronic “skin” that can generate and store electricity for prosthetic devices. The technology consists of layers of a finely tuned graphite-polyurethane composite covered by graphene. 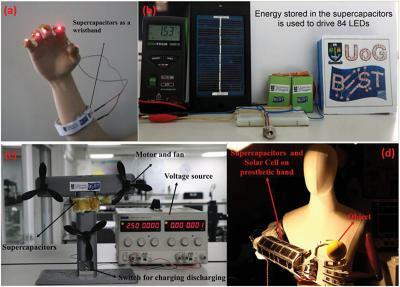 The team explained that the graphite-polyurethane works as an electric supercapacitor, storing energy that can be used at any time by a prosthetic. The graphene component is said to essentially be a solar panel that converts sunlight to electricity to charge the supercapacitor. 2018 will soon be over - and it was a good year for the graphene industry. 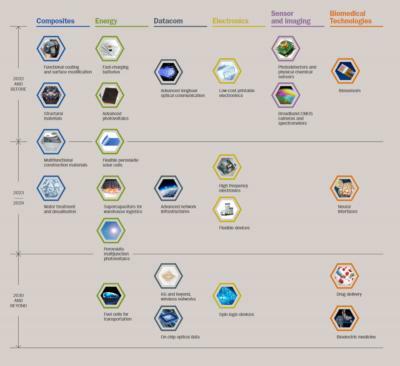 Graphene-based products are entering the market, and new advances in many applications have been reported. It seems that graphene is finally starting to fulfill its promise.